Vail’s Lindsey Vonn earned some redemption Saturday on a downhill course in Cortina, Italy where she’s now won a dozen times. Vonn crushed the course with an error-free run that made her the oldest female athlete to win a World Cup downhill, and she did it by nearly a full second over Tina Weirather of Liechtenstein. Oregon’s Jackie Wiles joined Vonn on the podium in third, replacing EagleVail’s Mikaela Shiffrin from a day earlier. The overall World Cup leader now by nearly 1,000 points, Shiffrin finished seventh on Saturday. Friday’s downhill winner — Sofia Goggia of Italy, who beat Vonn by a half second after the Vail racer nearly crashed — was a DNF herself on Saturday. 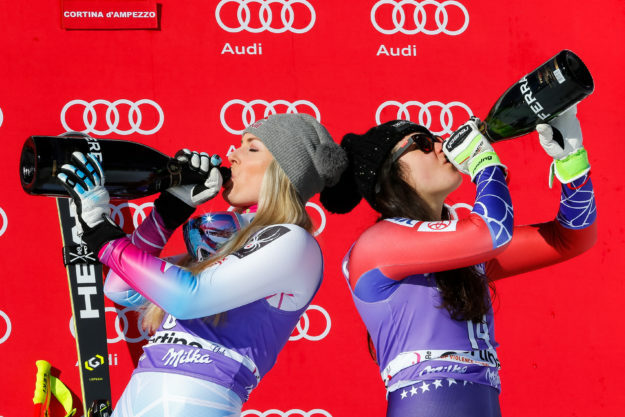 Vonn, meanwhile, had no mistakes on Saturday. The 33-year-old won her second World Cup race of the season, 40th career downhill and 79th race in total — a woman’s record just seven shy of the overall men’s mark of 86 by Sweden’s Ingemar Stenmark. Beaming with confidence and skiing with power, Lindsey Vonn (Vail, Colo.) produced a dominating performance to win her 79th career FIS Ski World Cup race in Saturday’s downhill at Cortina d’Ampezzo, Italy. Jackie Wiles (Aurora, Ore.) finished third and also punched her ticket to the 2018 Olympic Winter Games. Wiles was skiing just off Vonn’s pace at the top intervals but nearly overcooked a turn after catching a rut. But she made a strong recovery and built speed toward the bottom of the course to grab her second career World Cup downhill podium. It was a banner day for U.S. Ski Team with seven athletes finishing in the top 30, including Mikaela Shiffrin (Eagle-Vail, Colo.) in seventh; Breezy Johnson (Victor, Idaho) in 11th; Alice McKennis (Glenwood Springs, Colo.) 16th; Stacey Cook (Mammoth Mountain, Calif.) in 25th; and Laurenne Ross (Bend, Ore.) in 26th. Shiffrin leads the overall World Cup standings by a massive 907 points over Italy’s Sofia Goggia. She also leads the overall World Cup slalom and giant slalom standings, and is third in the downhill standings behind Goggia and Weirather. Up next, the women compete in super-G Saturday in Cortina.